Fractals are one of the weirder things you may come across when studying computer science and programming algorithms. From Wikipedia: "A fractal is a mathematical set that has a fractal dimension that usually exceeds its topological dimension and may fall between integers." This is a really odd concept—that you could have something like an image that isn't made up of lines or of surfaces, but something in between. The term fractal was coined by Benoit Mandelbrot in 1975. A key property of fractals is that they are self-similar. This means if you zoom in on a fractal, it will look similar to the way the fractal looked originally. The concept of recursion also is very important here. Many types of fractal algorithms use recursion to generate the values in the given set. Almost everyone has seen computer generated images of classic fractals, like the Mandelbrot set or the Cantor set. One thing about all of these classic images is that they are two-dimensional (or actually greater than one and less than two-dimensional, if you want to be pedantic). But there is nothing that forces this to be the case. Fractals can be any dimension, including greater than two. And with modern 3-D graphics cards, there is no reason why you shouldn't be able to examine these and play with them. Now you can, with the software package Mandelbulber. Mandelbulber is an experimental, open-source package that lets you render three-dimensional fractal images and interact with them. 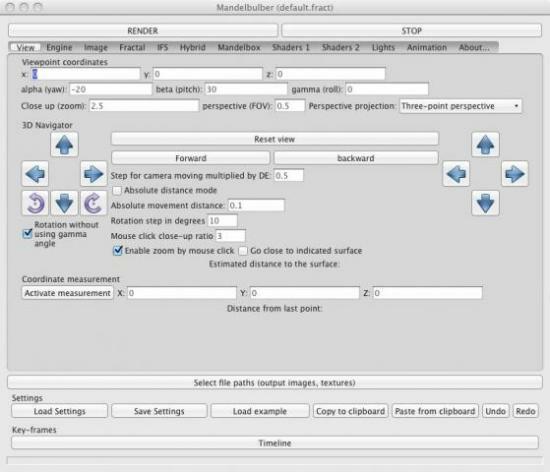 It is written using the GTK toolkit, so there are downloads available for Windows and Mac OS X as well as Linux. Actually, most Linux distributions should include it in their package management systems. If not, you always can download the source code and build it from scratch. If you want some inspiration on what is possible with Mandelbulber, I strongly suggest you go check out the gallery of images that have been generated with this software. There are some truly innovative and amazing images out there, and some of them include the parameters you need in order to regenerate the image on your own. The Mandelbulber Wiki provides a large amount of information. When you are done reading this article, check out everything else that you can do with Mandelbulber. When you first start up Mandelbulber, three windows open. The first is the parameters window (Figure 1). Along the very top are the two main buttons: render and stop. Below that is a list of 12 buttons that pull up different panes of parameters. You get an initial set of default parameters that will generate a 3-D version of the classic Mandelbrot set. Clicking on the render button will start the rendering process. If you have multiple cores on your machine, Mandelbulber will grab them to help speed up the calculations. Figure 1. The main window gives you all parameters that control the generation of your fractal. The rendered plot will be drawn in its own window (Figure 2). The third window shows you some measures of how the rendering progressed (Figure 3). You get two histograms describing the number of iterations and the number of steps. Figure 2. This is what the default 3-D fractal looks like. To generate new images, more than 70 examples are included with the installation of Mandelbulber that you can use as starting points. Clicking on the button Load example pulls up a file dialog where you can load one of them. 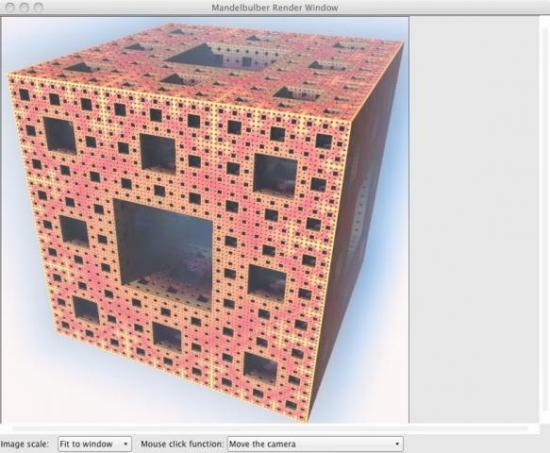 For example, you could load "menger sponge.fract". Clicking the render button will generate a 3-D Sierpinski sponge (Figure 4). Although technically, the set is only one topological dimension that encloses zero volume (aren't fractals weird?). Figure 4. A Sierpinski sponge has infinite surface area and zero volume. What can you change in Mandelbulber? Clicking on the fractal button pulls up the pane where you can set the parameters for the fractal itself (Figure 5). 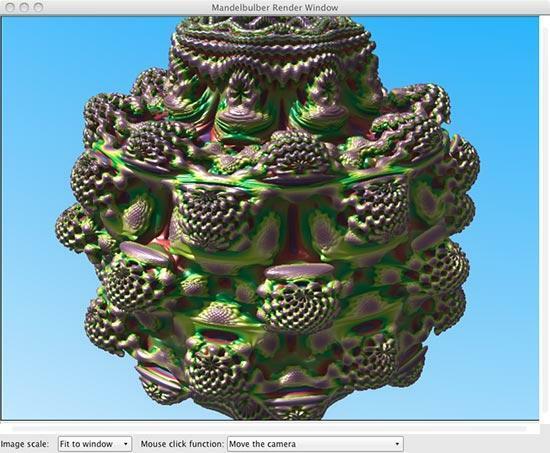 You can select from several different types of fractal formula types, such as mandelbulb, quaternion or menger sponge. You can set several options, depending on exactly which fractal type you choose. For example, if you select the iterated function system (IFS), you then can click on the IFS tab to set several different parameters. Figure 5. There are several different fractal types from which to choose. One of the issues is coming up with truly unique, yet aesthetically pleasing, sets of equations with which to experiment. To help in this regard, Mandelbulber has a hybrid option in the list of fractal types. When you select this option, you then can choose the hybrid button and set up to five different fractal equations (Figure 6). With this option, you can create very complex and sophisticated fractals to render. Figure 6. You can create a hybrid system made from a mix of up to five different fractal types. Mandelbulber doesn't just generate static images of these higher dimensional fractals. There is an option to generate animations of how these images change when some parameter is swept over. To start, you need to click on the Timeline button at the bottom of the view pane. This pulls up a timeline window where you can set the parameters used to generate your animation. The record button puts parameters into the actual keyframe number (Key no. field on the right). It then loads and renders the next keyframe if it is not the last keyframe. Then, you can add new keyframes with the "insert after" button or delete keyframes with the Delete button. To modify a given keyframe, you can double-click it to set the parameters, and then you can click on record to render the keyframe. Interpolation between the keyframes is handled by Catmull-Rom splines. Once you have the keyframes handled, you will need to render the full animation. Clicking on the Animation button in the main window brings up the parameters you can set. These include things like the number of frames to render from the keyframes, as well as the start and end frame numbers. You then can click on the Render from key-frames button to generate the animation. On my netbook, this is a pretty long process. For image generation, you also have control over camera position, lighting and shader options. You should be able to generate the exact image or animation that you want. If you are looking to generate some amazing 3-D landscapes or unique shapes for something science-fictiony, you definitely should check out Mandelbulber—just be prepared to lose several hours as you start playing with all of the parameters available.